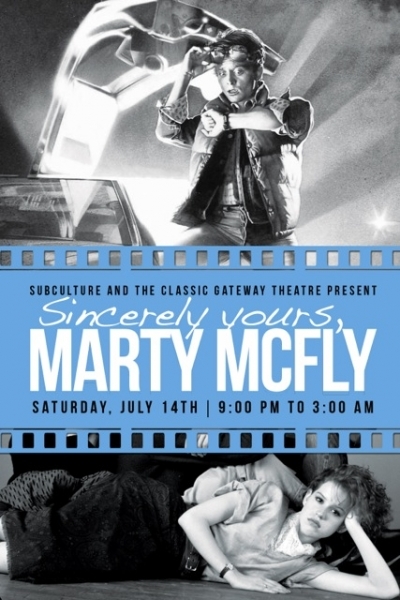 Newly renamed to fit its traditional aesthetic, The Classic Gateway Theatre has partnered with local venture Subculture to host Sincerely Yours, Marty McFly, a 1980s themed double feature event on Saturday, July 14. 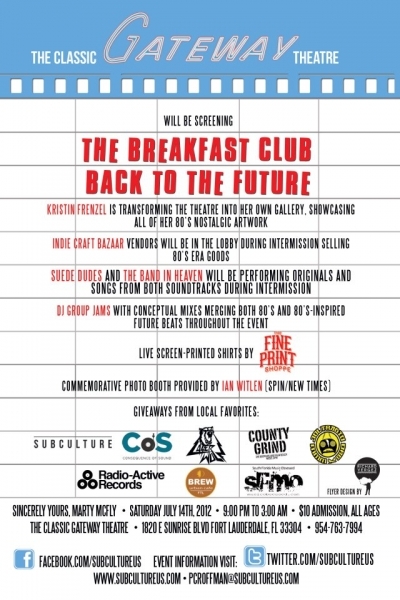 Acclaimed films of the ’80s, “The Breakfast Club” and “Back To The Future” will be screened for all ages to attend. At 8 p.m the lobby of The Classic Gateway Theatre will be open to the public where it will be filled with art, crafts, and music by JAMS DJs showcasing the sights and sounds of the decade. Though the interior The Classic Gateway Theatre displays the “Golden Age of Hollywood,” owner Arthur Friedman believes it’s time for the ’80s films and stars to shine. “There was much storytelling in those films and their soundtracks that isn’t as present today,” said Friedman. Subculture’s efforts to make Sincerely Yours, Marty McFly a nostalgic ride for older audiences also proves to be an interactive ’80s experience for younger audiences. Traditionally, The Classic Gateway Theatre has appealed to experienced and involved movie-goers, but partnering with Subculture and other small businesses has introduced the theatre to a newfound community that values art, music, film, and the mutual support of locally-owned businesses. Founder and CEO of Subculture Phillip Roffman believes Sincerely Yours, Marty McFly is more than just spotlighting the ’80s era, it’s to benefit a thriving business community. “We recognize that if local companies can partner with other companies for an entertaining and unique cause, we all benefit from each other’s success,” said Roffman. There is something to entertain everyone at Sincerely Yours, Marty McFly. Local artist Kristin Frenzel and craft vendors courtesy of the Indie Craft Bizarre will showcase ’80s themed treasures for purchase, a photo-booth will be set up on site courtesy of Spin and New Times photographer Ian Witlen, and The Fine Print Shoppe will be printing Sincerely Yours, Marty McFly, Subculture, and their own shirts on site. At 9 p.m.”The Breakfast Club” will hit the big screen first while “Back To The Future” will follow at 12:30 a.m. In between the films, an intermission will consist of live performances by local band Suede Dudes and a surprise musical guest. Raffle prizes by local sponsors Laser Wolf, Radio-Active Records, Brew Urban Café, Jolt Radio, and SFMO will be awarded from Subculture’s interactive scavenger hunt. Ten “Save The Clock Tower” and “Detention Slip” flyers are currently hidden at Laser Wolf, Radio-Active Records, and Brew Urban Café Victoria Park. Visit any of these three locations today and ask for more details for a chance to win a prize during the intermission. Sincerely Yours, Marty McFly are priced at $10 each and are available to purchase online at www.thegatewaytheatre.com or at The Classic Gateway Theatre box office at 1820 E Sunrise Blvd Fort Lauderdale, FL 33304. For more information and updates, check out the event page on Facebook. This event welcomes all ages to attend.